The film is about three women and their struggles with sexual harassment . The film took top prize in the 2010 Dubai International Film Festival. The filmmaker had to publicly deny that he had any intent to defame Egypt and assert that the issues are universal. The filmmaker had to even argue against banning of the film on the grounds that it could incite women to injure men in their sensitive parts with sharp tools. 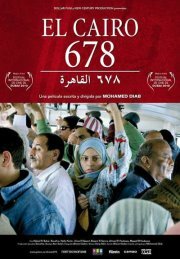 “678 is… a thoughtful study that leaves the gravity of the issue to speak for itself. “678 provides some objective insight into the dynamics of sexual harassment … and the fostering environment that made it possible in the first place. “All three women go through one or multiple incidents of traumatising sexual harassment. The incidents themselves aren’t exceptionally tragic; they’re even mild compared to the harassment stories that we’ve become used to hearing about. However, these incidents have upsetting physiological effects on the women, crippling them emotionally and functionally to the point that they transform into ghosts of their former selves. “Writer-director Diab shows restraint as a filmmaker by avoiding broad theatrics and melodrama for the most part. He also captures Cairo’s chaotic spirit with an authenticity rarely ever seen in Egyptian films.